A lethargic Rajasthan will have the tough task of taking on the ever in-form Chennai in match number 25 of the Indian T20 Cricket at Jaipur on Thursday. A lethargic Rajasthan will have the tough task of taking on the ever in-form Chennai in match number 25 of the Indian T20 Cricket at Jaipur on Thursday. 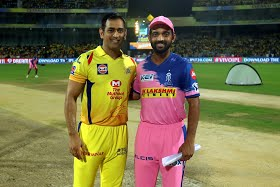 The game will be a clash between two teams with contrasting fortunes -- Rajasthan is currently seventh with just a solitary win while Chennai is just one loss in six games. Chennai goes into the match having registered an easy seven-wicket triumph over Kolkata on Tuesday. Despite Andre Russell at the other end, Chennai were successful in keeping Kolkata down to an extremely low total, which they chased down with ease. The variety of talent is what makes Chennai such a versatile outfit. In MS Dhoni, they arguably have the most brilliant leader, who is in great batting form and is lightning behind the series. In the last game, pacer Deepak Chahar stood out with the ball while the veteran spinners Harbhajan Singh and Imran Tahir also shone. It's almost as if there's a new hero every game. In contrast, Rajasthan are yet to find the combination that works best for them. Kolkata got the better of them in the previous match rather easily. Sanju Samson, who has a ton to his name in a losing cause, is still recovering from injury. Among others, Jos Buttler who has had a couple of failures after an excellent start to the season. The one bright spot for Rajasthan is definitely the return to form of Steve Smith, who hit an unbeaten 73 against Kolkata. There were hopes from captain Ajinkya Rahane, Rahul Tripathi and Ben Stokes but they too haven't lived up to expectations. If you look at their bowling, Jofra Archer started in rather impressive fashion. However, the poor form of the team seems to have rubbed off on him. And Jaidev Unadkat, despite being paid so much once again, just can't get things right.